Woodland camp … Fancy a day in our woodland environment ? A day of discovery at your own pace. A tailor made package where you can realise the true beauty of a classic English woodland. Start with a woodland ramble looking at all of nature’s treasures from flora to fauna, begin to ‘slow down’ and take note of all the detail that surrounds you. Relax with a ‘brew’ by our little stream and watch nature at work. Let us then test your senses and your observational skills. Content and well fed you could perhaps move on to some simple basketry, whittling or even just make your own ‘personal’ shelter. If wildlife interests you, why not try try some tracking? This is a group based activity. Need to get the message over to clients or parents? There is no better way than to bring bushcraft to you than by setting up our ‘expedition style camp’ in your grounds. A central fire with tripod and suspended kettle accompanied by all of the paraphernalia associated with bushcraft and Wilderness Living. Reindeer skins, atlatls, bows, leister spears, willow basketry, birch bark wares, spoons and cups. Even a tipi or lavvu with a balsam fir bed! The scene is set… we can then carry out various demonstrations such as firecraft, knifecraft, tracking, whittling, plantlore etc. In just one day, we can give a very tangible demonstration to show precisely what bushcraft has to offer. Team under canopy…. Over the past few years more and more Schools have started realising the true potential of immersing their students into the ‘world of bushcraft’. The common perception of bushcraft is ‘playing in the woods- building fires’ a slight extension of forest schools. The subject, however, is so detailed and in depth that a lifetime of study, still leaves its exponents as pupils. The art or science of bushcraft is to understand how everything works in our natural environment – the dynamics. This involves some in depth knowledge in subjects such as biology, human physiology, botany , natural medicines, geography, physics and so much more. In actual fact so much more… most educators are absolutely amazed! Having spent the first twenty years of their lifes in some sort of educational establishment Mark and Lucy can honestly say, bushcraft is the only ‘subject’ which draws fully on all of that learning. From Latin to Art to Sport to Agriculture and everything in between! Shelter positioning, resource availability, natural awareness, heat loss mechanisms, insulation, reflection, design detail, construction techniques, thatching, lashing, knots, uniformity, mathematical terminology, social interaction, team work, history, geography- topography, botany and so on. Annual programmes whereby we visit you on a regular basis over a full academic year and teach your pupils in your ‘wild’ area / or in the classroom. Covering all the subjects within our syllabus. Bushcraft days in our woodlands where we can teach and help the students put in to practice the things they have learnt. Train the trainers we can pass on some of our skills and knowledge to you to, enabling you to build your own ‘in school programmes’. 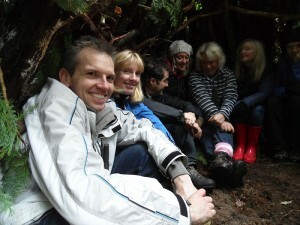 Inset training days time out of the classroom in our beautiful woodland, learning new skills, interacting with your colleagues giving you something a little different to take back to your own classroom. Team around camp We have recently spent a lot of time developing and ‘writing’ corporate bushcraft days. The links between business and bushcraft are very obvious if you experience both ‘worlds’, as we do. Getting things done properly in the business environment is essential – but in a harsh wilderness environment it can be critical. Again from our own experiences, the true value of bushcraft is that it brings an immense sense of ‘understanding’, determination and respect. Countrylore is run by business people who are dedicated bushcraft enthusiasts. We aim to provide the best tuition within our ‘realm’ from a truly unique perspective. 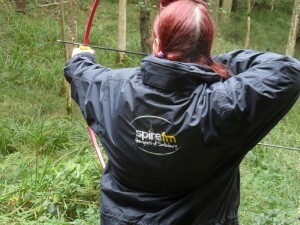 Over the past twelve months the Countrylore team have proudly hosted bushcraft based experiences for various teams or groups of adults from radio stations , advertising agencies, dental practices , retailers and accountants.